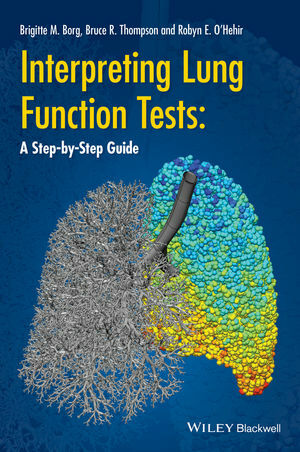 provides unique guidance on the reporting of pulmonary function tests, including illustrative cases and sample reports. utilizes the many references available on interpretation of lung function and provides a teaching/reference tool for report writing of lung function results routinely performed in clinical practice. provides examples of results and written reports (with commentary where necessary as further explanation). focuses primarily on tests performed as part of routine clinical testing: spirometry, static lung volumes, gas transfer, bronchial provocation tests, and maximal respiratory pressures. Professor Bruce Thompson is Head of the Physiology Service within the Department of Allergy, Immunology and Respiratory Medicine, Alfred Hospital and Monash University. He is the head of one of the largest pulmonary function laboratories in Australia and combines a very active research program with his current role as co-chair of the Global Lung Initiative for the measurement of gas transfer factor. His contribution to respiratory research and laboratory measurement was recognised in 2011 when he was awarded the ANZSRS research medal (Fellowship). Ms Brigitte Borg is a Certified Respiratory Function Scientist. Brigitte is the Deputy Head of the Physiology Service, Allergy, Immunology and Respiratory Medicine at The Alfred, Melbourne. She is responsible for the day-to-day management of a busy lung function laboratory that encompasses clinical, research and education in its core activities. Brigitte has actively participated in the training of advance trainees in lung function interpretation over many years and has been on the faculty of the American Thoracic Society's Post Graduate Course for The Interpretation of Lung Function since 2008. Brigitte's research interests are twofold: quality of measurement of lung function and oxygen therapy. Professor Robyn O'Hehir FRACP, PhD, FRCP, FRCPath is Professor and Director of the Department of Allergy, Immunology and Respiratory Medicine, Alfred Hospital and Monash University. After graduating in Science (Microbiology, Biochemistry and Physiology) and then Medicine at Monash University and Alfred Hospital, Melbourne, Australia, she completed her clinical postgraduate training at Royal Brompton Hospital and the University of London, specialising in both Allergy and Clinical Immunology and Respiratory Medicine. Professor O'Hehir conducts an active program combining clinical care, clinical and experimental research and education. She is an Editor of the international journal Clinical and Experimental Allergy and has a strong interest in translational medicine.